The latest Dreamworks movie HOME is set bring an adorable alien invasion to the big screens just in time for the Easter break. Little Legs had been anticipating it’s release having seen the trailer at the cinema and coming from the same production company that brought you How to Train Your Dragon, I admit I was looking forward to seeing the latest animation. HOME is a story about an optimistic alien race named Boov, who are led by the infamous leader, Captain Smek voiced by Steve Martin. The Boovs invade planet Earth to hide from their enemy and make it their new home. The Main character Oh voiced by Jim Parsons (The Big Bang Theory’s Sheldon Cooper) is a loveable misfit who isn’t well liked within the Boov community, The Boovs aren’t very knowledgeable when it comes to humans and they are convinced that they are doing the silly humans a big favour by relocating them, in order for the Boovs to live peacefully and away from their enemy. All the humans are relocated with the exception of one girl, Tip, who manages to avoid capture. Whilst on the run from the Boovs, she forms an unlikely relationship with the hapless Boov, named Oh who was banished and on the run from his own kind after accidentally notifying the enemies, of the Boovs whereabouts. 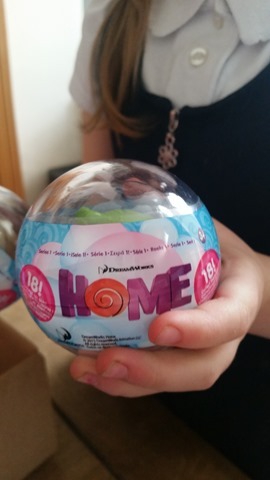 In Celebration of the animated DreamWorks movie release of HOME, Flair have released a huge range of adorable HOME toys and merchandise for you to enjoy at home. The toy collection features all the recognisable characters such as Oh, Tip and Captain Smek in a selection of plush toys, dancing toys, figures and collectibles, helping your little one to recreate their very own magical BOOV stories! Little Legs was lucky enough to have been sent a selection of Toys and tickets to see the latest DreamWorks movie. Her favourite toy from the selection is the Shusher Wand which opens up to reveal a light up Captain Smek as well as playing recognisable sounds and phrases from the movie. It’s great role playing item which Little Legs has been using to shush me when it pleases her. The Shusher Wand has an RRP of £9.99 and it requires 2 AAA batteries which are included in the set. 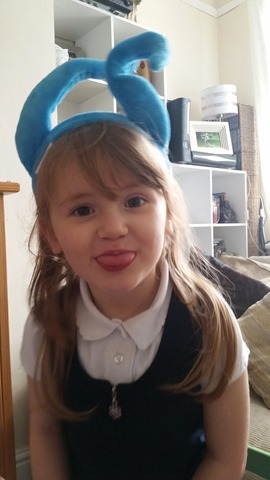 Our box also contained a plush pair of Boov Mood Ears which Little Legs absolutely loved, she really enjoyed shaping her ears to reflect her mood, especially excited, angry and silly. They are a great “pocket money” purchase with an RRP of £3.99 and they come in a selection of 6 of colours. We also received a 13” plush red plush Boov which is super soft and cuddly with embroidered features. The plush toys start at £6.99 and up to £19.99 for the larger talking ones. Also available in the collection are colour changing Boov figures that change colour in response to heat and touch , an Animated Dancing Oh Plush which features four phrases and three different songs from the movie and there’s also a animated Tip and Oh doll that will speak 5 different phrases from the movie. After a couple of days off of school due to a rather nasty bug, Little Legs was well enough (or so she said) to pop along to our local Showcase Cinema for a screening of HOME. She was full of beans and looking forward to eating far too much popcorn and washing it down with Tango Ice Blast whilst watching the anticipated DreamWorks HOME. Lasting 94 minutes, the film was exciting and enthralling enough to keep Little Legs entertained, that’s pretty good going for a 4 year old that doesn’t like sitting still at the best of times. The movie made her chuckle….real heart warming belly chuckles, despite being rather poorly still. She took along her Shusher Wand and also the Boov Mood ears which made her experience that little more special, she enjoyed repeating the characters especially when it came to “I’m waving my hands in the air, like I just don’t care”. Was Little Legs or yourself disappointed that there was no Tip included in your samples? Will there need to be an addition to the collection to make it complete? ?